The purpose of this standard is to establish performance objectives for procedures for the protection of personnel and property in, on or around machines or equipment during repair, maintenance, operation, installation and associated activities from injury due to unexpected start-up or release of stored energy from the equipment or system/ process or induced energy. The employer shall establish a program consisting of energy control procedures, employee training and periodic inspections to ensure that before any employee performs any servicing or maintenance on a machine or equipment where the unexpected energizing, startup or release of stored energy could occur and cause injury, the machine or equipment shall be isolated from the energy source and rendered inoperative. Lockout/tagout devices shall be of distinctive design and appearance and be used solely for the purpose of providing personnel and property protection. It is important to be specific in designing your lockout tags so they do not become ambigious in contrast to other devices. Appart from the appearance, it it also crucial that the lockout/tagout tags are capable of withstanding the enviroment being used. We can help your operations in designing and supplying specialized lockout devices. - Add your company logo & branding. - Any shape, size or color. - Eyelet/Grommet size, (Metal or Non-Conductive Plastic). - Industrial strength tear-resistant materials for outdoor use. - Seal Tag self-laminating protective overlays (1 or 2 sided). - High Volume, low cost bulk ordering. Custom re-ordering is made simple, with scheduled reminder dates to ensure your inventory supply is adequate. 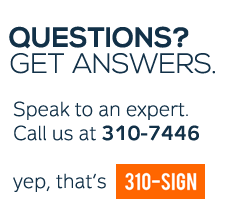 Call 310-SIGN(7446) for more information.